This article is about second-hand stores. For the computer-science term "free store" (redirected to this page), see Dynamic memory allocation. Give-away shops, swap shops, freeshops, or free stores are stores where all goods are free. 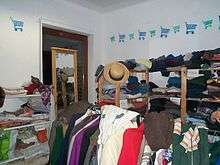 They are similar to charity shops, with mostly second-hand items—only everything is available at no cost. Whether it is a book, a piece of furniture, a garment or a household item, it is all freely given away, although some operate a one-in, one-out–type policy (swap shops). The free store is a form of constructive direct action that provides a shopping alternative to a monetary framework, allowing people to exchange goods and services outside of a money-based economy. The anarchist 1960s countercultural group the Diggers opened free stores which simply gave away their stock, provided free food, distributed free drugs, gave away money, organized free music concerts, and performed works of political art. The Diggers took their name from the original English Diggers led by Gerrard Winstanley and sought to create a mini-society free of money and capitalism. Although free stores have not been uncommon in the United States since the 1960s, the freegan movement has inspired the establishment of more free stores. Today the idea is kept alive by the new generations of social centers and environmentalists who view the idea as an intriguing way to raise awareness about consumer culture and to promote the reuse of commodities. Culturally, some people feel that accepting free goods carries a stigma, so many people who use these shops are those who are led to them either by need (financially poor, such as students, single parents, the working-class, and the elderly) or by conviction (anti-capitalists and environmentalists). Swap shops, where you are asked to bring something in order to take something, are one way in which stigma issues are addressed. In the United States, Really Really Free Market groups organize periodic "market days" in city parks. Participants are encouraged to share unneeded items, food, skills and talents (entertainment, haircutting, etc. ), to clean up after themselves and to take home any of their own items they were unable to give away during the event. In other cases, used goods are picked up from the donors' homes, thus eliminating overhead costs. Donors are often not motivated by financial need or strictly anti-capitalist conviction, but by a desire to get rid of what would otherwise be garbage without adding it to landfills. Another recent development in the give-away shop movement is the creation of the Freecycle Network. It was started in Arizona for the purpose of connecting people who had extra belongings to get rid of with people who needed something, organized as discussion/distribution lists, and usually hosted on one of the free websites. In 2007 a similar concept began to flourish in Devon, England where a group of free-bookshops called Book-Cycle began; A volunteer-run registered charity, that gives books and trees away in exchange for a donation. Any proceeds are then used to send free books to developing countries and plant trees in the local area. Wikimedia Commons has media related to Freeshops. ↑ John Campbell McMillian; Paul Buhle (2003). The new left revisited. Temple University Press. pp. 112–. ISBN 978-1-56639-976-0. Retrieved 28 December 2011. ↑ "Overview: who were (are) the Diggers?". The Digger Archives. Retrieved 2007-06-17. ↑ Gail Dolgin; Vicente Franco (2007). American Experience: The Summer of Love. PBS. Retrieved 2007-04-23.